Editor’s Note: Abdi Farah Saeed “Juxa” is a veteran Somali journalist, writer, poet, statesman, and public figure who has held both senior-level state and federal positions. He was the Education Minister in Puntland from 2009 to 2014. Until January 2018, he was the Federal Minister of the Interior, Federal Affairs, and Reconciliation. In addition to his state and federal posts, Juxa worked with the United Nations as a political affairs officer and for the Puntland Development Research Center as a senior governance researcher. 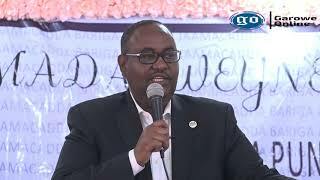 He is expected to run in the Puntland presidential elections in January 2019. On June 15, 2018, while Juxa was in Nairobi, he talked with Wardheernews contributor Hassan M. Abukar on the phone. For the purposes of brevity, the following is a condensed version of that long interview. WardheerNews (WDN): Mr. Juxa, are you officially running for the Puntland presidential election? Juxa: I will make an official announcement by mid-July. The Tukaraq crisis between Somaliland and Puntland has actually delayed my impending announcement of my intention to run for office. 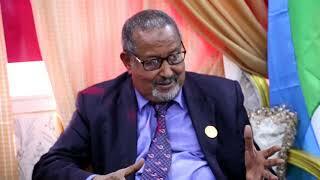 WDN: Is there any possibility Puntland President Abdiweli Gaas will postpone the election? Juxa: I hope not, because if Abdiweli uses the Tukaraq tension as a pretext to put off the election, there will be a constitutional crisis and a problem with the legitimacy of his government. The worst that can happen in Puntland at this moment is to question or to disregard its own constitution and fall into an anarchy and chaos. That would be the ultimate betrayal of Puntland. We are at war cannot be used as a pretext for an extension and excuse. One should defend the country and safeguard its own constitutional order at the same time. I hope President Gaas is wise enough to understand that. WDN: Is it likely that the upcoming election will be a crowded field of presidential hopefuls? Juxa: Puntland elections always attract a large number of candidates, but I believe the competition will start to narrow down to a few individuals before the end of the year. WDN: What makes you stand out from the crowd? Juxa: I have been in Somalia for the last 10 years. After many years in the diaspora, I have held important positions. I know that, with all the potential Puntland has, it has unfortunately become stagnant. People have lost confidence in the state’s leadership especially and the government in general. I stand for a new Somalia — a balanced voice that endeavors toward consensus building, the empowerment of federated member states, and good governance. I know it is a difficult process, but I want to add my voice to this noble endeavor. WDN: How would you help reconcile the difference between strong member states and a central government that wants to expand its power? Juxa: It is very unfortunate that Somalia’s central government has been encroaching on member states by interfering in their affairs in an attempt to weaken them. Its modus operand is to use money to remove some of the state leaders and replace them with malleable and pliable leaders. here should be a political arrangement between member states and the federal government based on respect and mutual consultation. Under the current leadership of Villa Somalia, federalism is under threat, and we cannot and should not allow that to happen. WDN: You sound like someone at war with the federal government. Juxa: No, I am not. All I want is that the federal governments shift its priorities. Instead of focusing on issues like sharing natural resources and working on the provincial constitution, I want to see genuine work done on consensus building and meaningful debate on state-building — not taking shortcuts. The central government’s leadership has a tendency to have two people who will cook the national agenda behind the scenes and the rest are expected to rubber stamp any policies they introduce. WDN: Are you the right person to deal with the federal government? After all, until recently, you were a federal Interior Minister and you lost that job. What happened? Juxa: (laughs) I am glad you asked. I lost my job as Interior Minister because of “Is–aqoon la’aan”—by that I mean I was not screened by the ideologues of Villa Somalia as I had gotten the job through Farmajo. Later, it became apparent that these ideologues and I couldn’t coexist because we had fundamentally two opposing views on how to build Somalia. Then presidential candidate, Farmajo, called me in 2015 to help him, if elected, with educational matters. We did not know each other, but he was familiar with the work I had done as the Education Minister of Puntland. Honestly, not many people expected Farmajo to win — it was either then-incumbent President Hassan Sheikh or former President Sharif Ahmed who was projected to be elected. At any rate, Farmajo won. I thought I was slated for the education portfolio, but for reasons that had to do with horse-trading among vying groups, I was appointed as the Interior Minister. As you know, it is a politicized position and my tenure coincided with some debilitating crises Somalia had faced, such as the two wars between Puntland and the Galmudug State; the political crisis in Galmudug between that state and Ahlu Sunnah wal-Jamaaca group; the Qalbi-dhagax debacle (when the Somali government handed over Colonel Qalbi-dhagax, a member of the Ogaden National Liberation Front , to Ethiopia); working with member states that felt threatened by the interferences of the central government; the murky issue of citizenship (who is Somali? ), which my ministry was asked to table, and finally what to do with the 2020 elections. It was also at that time when the central government worked behind the scenes to replace President Xaaf of Galmudug. I had a fundamentally different approach to dealing with the member states: I wanted their empowerment, fostering a fair working relationship between the federal government and the member states, and I wanted to build an environment conducive to cooperation and consensus. The federal government had a different agenda — it wanted to create member states that take marching orders from Mogadishu. WDN: Are you saying that the member states saw you as their champion? Juxa: Initially, as a Puntlander, there were some understandable reservations about me on the part of the Galmudug leadership. But eventually, I gained their respect and admiration. WDN: If elected as Puntland’s president, how would you deal with the state’s neighbors: Somaliland and Galmudug? Juxa: First and foremost, I strongly believe that we are all Somalis and brotherly. Puntland can only develop and prosper when its borders are not aflame. Puntland should lower political tensions with its neighbors, engage in a dialogue to solve issues with talks, not guns; and to undertake genuine confidence and cooperation. I am a strong believer in positive engagement. Somaliland, of course, is more advanced in terms of development than Galmudug, which does not generate its revenues. As our neighbor, we should help them as much as we can and cooperate with them in creating peace, trade, and a good neighborly environment. 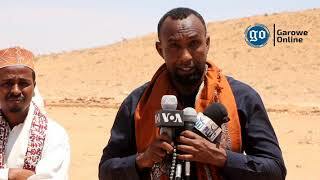 WDN: What is your position regarding the Tukaraq crisis between Puntland and Somaliland? Juxa: I don’t want to see either Abdiweli or Muse Bihi (Somaliland president) using this crisis for political purposes. It was Bihi who started the hostility and Puntland has every right to defend itself from any aggression. 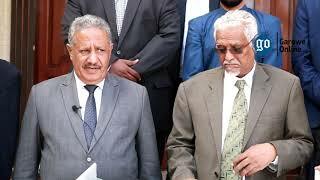 As I have said before, the people of Somaliland and Puntland are brothers, and the issue of Tukkaraq in particular and that of the broader matter of the fate of the people of the Sool, Sanaag, and Ayn regions in general must be decided by those in these respective regions. In other words, these people have to be given a voice to freely decide their fate. WDN: What are your top priorities for Puntland? Juxa: I want to usher significant changes in three sectors: security, economic growth, and good governance. I want to engender a new thinking based on good vision, planning, and nurturing the knowledge and manpower of the people of Puntland. I want to strengthen security, which has been a major problem in the state, by building the army and the security forces, and make sure the salaries of soldiers are paid on time. The threat of Al-Shabaab and ISIS is real, and it can only be tackled by a cohesion of the community, a strong and disciplined army, and significant economic growth. I want to see economic growth — not only by focusing on developing one port—but by utilizing and harnessing all the resources of the region. I want to seek the advice, counsel, and help of all those in the state who can contribute. Most of all, unlike the current president of Puntland, I want to delegate. 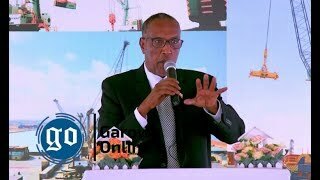 WDN: Speaking of ports, what is your position on two issues: the United Arab Emirates (UAE) signing a separate treaty with Puntland, a member state, instead of dealing directly with the federal government, and the impact of the Gulf crisis on Somalia? Juxa: The provincial constitution is not clear about this matter. It is my understanding that, until there is a viable federal government, member states can sign treaties with foreign governments that will help develop these regions economically. I have no problem with DP World developing the Bosaso Port. It is good for Puntland. WDN: So, you agree with Abdiweli, right? Juxa: I would have done it differently than Abdiweli—he took the wrong path on this issue. He employed secrecy in signing the treaty with DP World. I believe in transparency and open debate within existing institutions about an important matter such as signing a treaty with the UAE. WDN: And the Gulf Crisis? Juxa: (laughs) the federal government is not neutral on the Gulf Crisis—it is pro Qatar. Qatar is a small country, and I wonder what this country has done for Somalia. It is in Somalia’s long-term interest to work with Saudi Arabia and the UAE. WDN: As a former journalist and someone with an advanced degree in mass communications, how do you see the state of the press in Puntland? Juxa: It is a sad story, and it is what I call duub-jileec siyaasadeed (political relapse or political remission). Puntland always had freedom of press, but recently journalists live in fear of doing their basic job of reporting the truth. Overall, the mass media in Puntland has been limited to Facebook. The crux of the problem is lack of good leadership in the state government. There is no conducive environment for the press to develop and flourish. Abdiweli has relegated the Puntland Broadcasting Agency (which was funded by Italy) to the Ministry of Information. Hence, the agency lost its independence.